Café Forró is music and dance project based at Ort, the Old Print Works, which celebrates and shares forró, the music and dance style from the North East of Brazil. Forró has taken Europe by storm in recent years; it’s a very happy style of folk music and forrozeiros (the term for forro fans) dance ‘coladinho’ (very close) meaning that people become quite quickly addicted. We give weekly dance classes for beginners to intermediates; organise monthly forró parties, usually with our resident band, Forrobamba and sell Brazilian homemade food. This Saturday, the accordionist Junior Dias will be playing with two members of Forrobamba, Guilhermino Ramos (Triangle and Vocals) and Cassio Matheus (Zambumba). What does Café Forro aim to do? 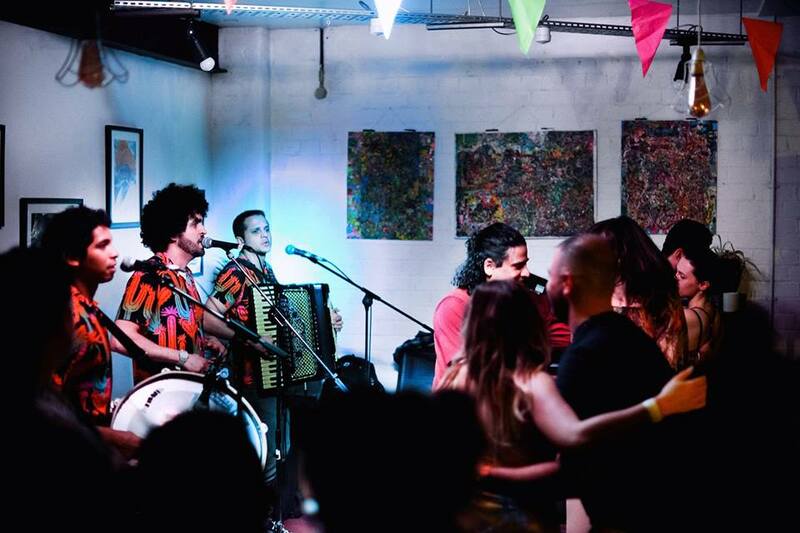 Café Forró aims to spread forró culture, music and dance in the West Midlands by bringing people from all backgrounds and walks of life together to have a great time. Why is Café Forro helping to save the Old Print Works? We are attracting new people to the Old Print Works who previously had never been. Many of our forrozeiros come from elsewhere in Birmingham, so this really helps to spread the word about Ort, the Old Print Works and the cause. What does the Old Print Works mean to you? When we think of the Old Print Works, we think of Ort Cafe. 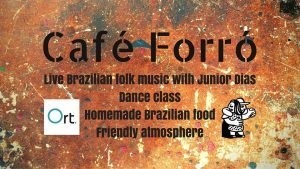 It’s a great community hub and we feel privileged to be able to bring forro to such a vibrant, varied and open minded Cafe/Venue. It’s an asset to and reflects its diverse community. How does Café Forro tie in with Brum Spirit’s theme of We’re In This Together? One of the great things about forró culture is that it is very inclusive. It doesn’t matter how old you are, what your level of dance or social background is – everyone is welcome. 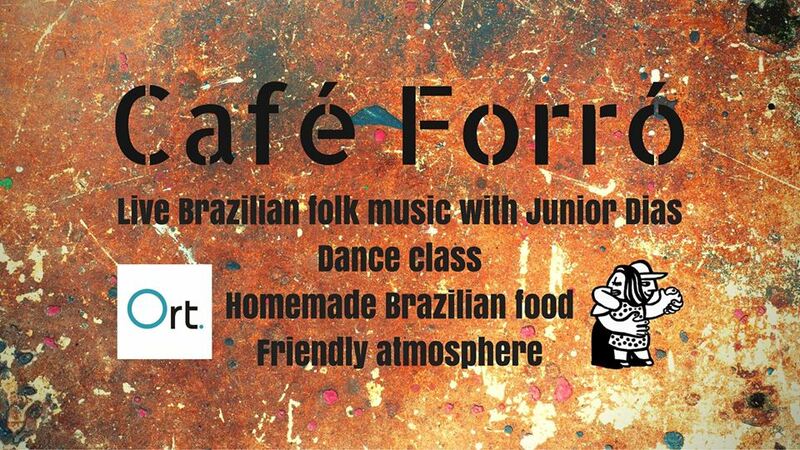 Who can get involved with Café Forro? Where can we find out more about Café Forro? Check out the Facebook page here or come along to one of our weekly classes on Tuesdays at Ort, 7:30pm. How did you get into graffiti art? I’d always wanted to be some sort of artist as a kid and would always be drawing characters of my favorite stuff or making up monsters, zombies and robots..Sometime around 98,I went with some friends to check out a place called “Selly Oak graffiti park” and had my mind blown by something I’d never seen before and didn’t understand…Everywhere was covered in paintings and writing, there were cool characters on the walls and color everywhere..The main pieces I remember where by a crew called FKS..T-Bone,Korsa,Zooki,Crem, were some of the names that stood out to me that day and I knew I wanted to try spraying some of my characters on a wall.. From that point I started seeing it everywhere and the more I practiced and studied it, the more my respect for the art form and culture grew..
Why did you choose graffiti art as opposed to any other medium? 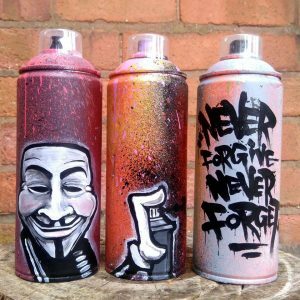 There’s so many branches to graffiti and there’s so much to learn about it..From tagging to mural work, all of which is classed as graffiti, there’s a whole load of learning and years of practice involved to be able to control the paint and create your own style to build your name.. The history of graffiti is a cool story full of myths and legends and as an art form developed by youngsters, mostly in the dark, it’s come a long way.. Every country and city around the world have their own scene,style, history and way of doing things so it’s always developing and inspiring new artists and techniques. When I first started I think it was how hard I found it, which pushed me to want to get better at it..Meeting other graffiti writers and going painting with them has made me some really good friends over the years.It’s kind of a social and anti social culture, where most graffiti is painted for other people who do graffiti to love or hate and can have a life span of minutes or years depending where or what it is.. Graffiti incorporates so many skills from tagging (which is like a form of calligraphy), to painting huge letter pieces (which is a kind of typography)..painting and designing characters takes some cartoon/illustrator skills and spraying paint is such a fun way to practice them all.. Most things really.. From everything I was into as a kid to the amount of paint, space and time I’ve got to work with. 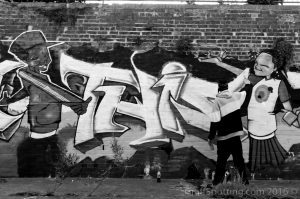 I get inspired by loads of artists who make me want to try new stuff out in my own way..My graffiti letters and characters have been developed over the years and their technical difficulty increases as my skills with a can improve. I used to like painting models and sculpting when I was younger, so after seeing a few graffiti artists from overseas design toys several years ago, I wanted to see my character as an object you can hold..So I did that.. I’ll always be into spraying my name on a wall but the idea of my work being displayed in collections and looked after, rather than painted over is pretty cool.. Canvas work and sculpts are approached differently to walls, but all of them kind of inspire each other in a way..
Do you prefer to work on big public art murals, like the River Rea mural, or on smaller canvases and private commissions? Why? I think I like them both the same but for different reasons.. Public murals are usually hard work but fun to paint, and it’s interesting hearing what people think before it’s even been finished.This can sometimes spark new ideas and help with the mural…It’s nice to have their support and encouraging words shouted at you from passing cars but it can take much longer to paint as you have to keep explaining your not a famous stencil artist and you did this all free hand.. Painting on the River was great and everyone was really supportive of what we were doing..Leaving such a big piece of artwork out in public is so different to working on a piece that will hang in one persons house..The fact that someone is willing to spend their hard earned money and invite a piece of my work into their home is really cool, but on a different level..
What was it like to collaborate with Ashekman and Zooki on the River Rea mural? It was interesting and nice, and the wall came out really cool I think.. Having Zooki as one of my earliest inspirations in our graffiti scene makes it a pleasure to paint with him.. Over the years we’ve painted together a few times on walls at graffiti jams, so it was cool to get him involved with this mural, as he grew up around the area.His character designs and painting skills are amazing and it’s always an honor to paint with him.. Ashekman really came through and after having no sleep on day one, due to travelling, they still got busy and left us with a really cool piece in their calligraphy style..It was cool spending some time with them and hearing about what the scene in Beirut is like. It’s a shame they couldn’t stay for longer but hopefully one day we’ll get another wall done together..It was really nice to meet those guys and paint, and I think what they put up really fits in well with the message of the mural..
How does the mural tie in with the central messages of Brum Spirit? What other community projects and public art murals have you worked on? There’s the Welcome To Kings Heath wall that we worked on 3 years ago for BrumSpirit with Ficore from Brazil.Then the year after I was lucky enough to be able to paint the front of PST nightclub in Digbeth with RCF1 from France for Brum Spirit.. In Acocks Green at Millennium Green there’s a long wall I was asked to paint around a nature reserve/dog walking area..It’s a quite a long wall and fun to paint because it has all four seasons, goes from day to night and includes almost every animal you might see there. Another favourite from last year is a school I painted in Selly Oak.. It’s not really public as it’s a school, but the 40ish walls I painted around the outside of every Porta-cabin classroom around the grounds,definitely brightened the place up..They were a depressing grey before, and now they have lots of color and helpful learning phrases with positive words etc suited to each lesson and classroom..I can imagine that would have a huge impact on any child, especially one with learning disabilities and it’s cool to think how lots of kids over the years might remember something, because they saw it on a painting every day..
What do you hope people will take from your work, particularly your public art murals? It’s nice to be able to change peoples perceptions about what they might have thought graffiti was or can be, before seeing something they can relate to and understand..I hope it inspires some people to try and become artists and it’s a weird feeling when you’re on a bus going past something you did and you hear a kid say “coool” and start pointing at it..They all kind of serve a different purpose and it’d be nice if they appeal to people if different ways..
What does this year’s Brum Spirit’s theme, “We’re In This Together”, mean to you as an artist? As a theme for a wall it had so much scope to where we could have taken it. As I said in another answer, a passer by commented on how fitting it was for the state of the world, I think we started painting this a few days after all that Brexit madness..As someone who lives in the area we painted the wall, which has lots of nationalities and religions living side by side, it’s nice to leave a positive piece up for everyone to take something from which will always mean something, depending on how you decide to read it..
You can check out more pictures of the “We’re In This Together” River Rea by Hoakser, Ashekman and Zooki here. How did you begin as an artist? When I was 7, I painted a picture of a boy at Wattville Junior School, in Handsworth, Birmingham. I attempted to make the boy’s eyes blue, but I ended up making the paint too runny, which prompted the teacher to ask me why the paint was running down the page…I told her it was because the boy was crying. That work ended up in a show of childrens’ art at Tate Britain. It taught me that in the arts at least, mistakes can be a positive thing. What is the concept behind Hi-Lite Arts? Hi-Lite is just one, but an important part, of an ongoing project called The Salon, that I’ve been developing with a number of well known and emerging artists, designers & creatives, along with filmmakers and performers, some of whom include my postgraduate Contemporary Arts students from Coventry University. What are the aims of the visual art-works at the event? 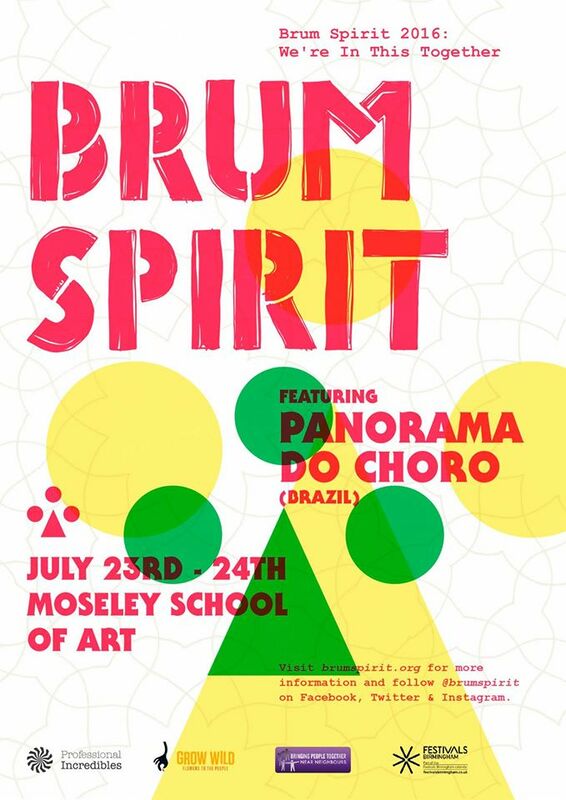 To re-animate and recapture the spirit of a fascinating space and place – the old Moseley Art School, which ceased to be seat of creative learning in 1975. 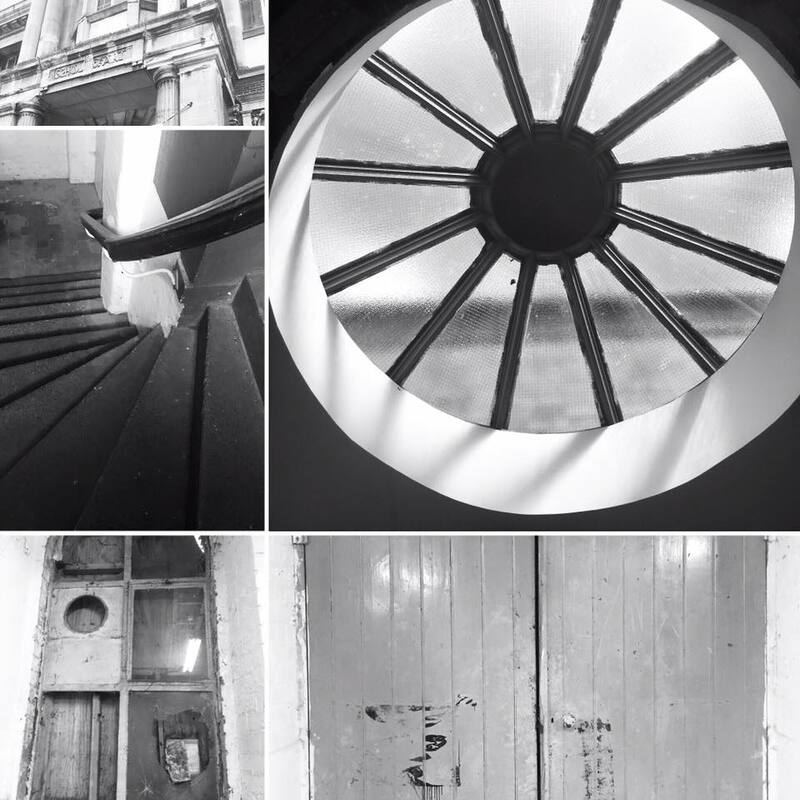 Using contemporary arts, interventions and performances which are unconventional and non-traditional, we hope to evoke the spirit of a building, which previously bore witness to so many creative outpourings over several decades of the 20th Century. What can the audience expect to see from these art-works at Brum Spirit? We want the audience to be entertained and surprised, but perhaps more importantly, it’s about having a conversation with the public. 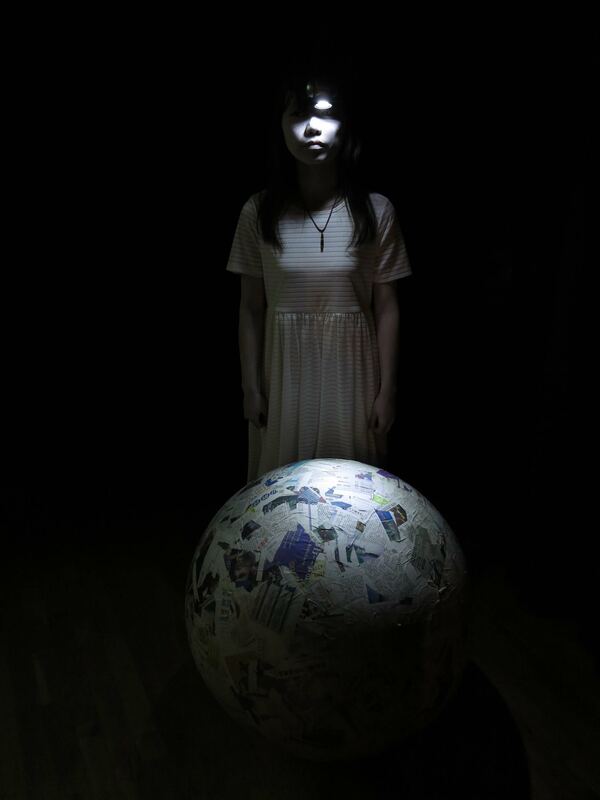 What do the different elements of visual, phonic and performative art bring to the programme? There are three primary themes or departure points for the exhibition: Redamency ((n.) the act of loving the one who loves you; a love returned in full), Confrontation and Environment, which hopefully provide a kind of social sculpture. What was it like to collaborate with the group artists on this project? Like all projects of ambition or worth, it was a challenge and a privilege. How does this exhibition tie in with Brum Spirit’s theme of We’re In This Together? It’s simple… It’s a collaboration that involves music, film and art to engage a wide and diverse audience. Ultimately, it presents us with the opportunity to positively share a complex space in a time of increasing challenge and change in the world. What do you hope the audience will take from the exhibition at Brum Spirit? 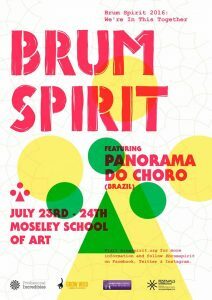 For me and my creative partner (Tolley), Brum Spirit is a celebration. A glimpse into the epic and the everyday. Where can we find more about your work? Darryl Georgiou is an award winning artist whose work is held in international collections, including the Victoria & Albert Museum and the Deste Foundation in New York and Athens. 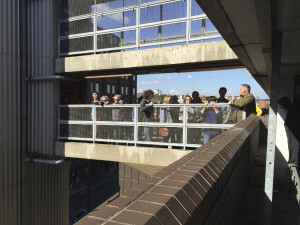 He is the postgraduate programme leader for Art & Design at Coventry University and a Director of arts and photography organisations, ‘Still Walking’ and ‘Some cities’. He was artist in residence at the ‘Ars Electronica’ Futurelab in Linz, Austria in 2014. He is currently a recipient of a Henry Moore foundation research award for the forthcoming ‘Liber Topia’ project. He has an interdisciplinary production company with his partner – film maker and lens based media artist, Rebekah Tolley. Most recently, she was Creative Producer for the documentary feature, OKHWAN (2016) https://www.youtube.com/watch?v=e2iM30Rk6fY. Rebekah is a graduate of Coventry University’s MA course in Design & Digital Media/Arts (the first digital arts postgraduate course in Europe) and of the 2011 EAVE European Producers programme. Rebekah is owner of an interdisciplinary production company with her partner, artist Darryl Georgiou. What is Empty Rooms: the Guided Tour? 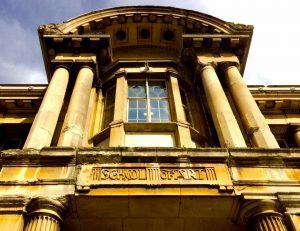 A 60 minutes guided tour for up to 12 people exploring the three levels of Moseley School of Arts. What can attendees expect from the tour? Empty Rooms demonstrates that abandoned spaces are anything but: architectural aspects, forensic details, subtle clues and our own presence there reveal elements of a greater story still being played out. Empty Rooms takes the form of a guided walk but drops the notion of a tour being a ‘sight seeing’ experience and encourages the audience to uncover the purpose, history and meaning of a place by active observation. What is the process when approaching a room? I will begin by narrating and steering observation through an environment: details, atmosphere, materials &c. I will encourage observations from the group and incrementally become more ambitious in scope. In larger rooms I will allow a group to explore briefly at will and then thread together their independent discoveries as the group warms to the experience. 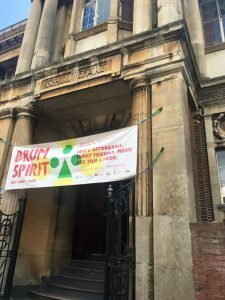 How does it tie in with Brum Spirit’s central message of We’re In This Together? The tour guide’s usual role is to deliver information and to direct movement, attention and subject. Empty Rooms encourages audiences to contribute to the shared experience with their own observations, memories, outlooks and discoveries. A recognition that the group’s pooled knowledge as as valuable as the guide’s research and knowledge. What do you hope the audience of your guided tour will get from the experience? A sense of how close observation of an environment, considered and playful responses to clues (especially in a group setting) can create a greater attachment to our environment: room, building, street, town and city. Does leading such a niche tour help you develop as an artist? I’ve gained confidence in taking this approach on recent guided tours, recognising the value it has with audiences and would benefit from the opportunity to expand the scope of environments. What is the favourite or most interesting Empty Rooms tour you’ve led so far? 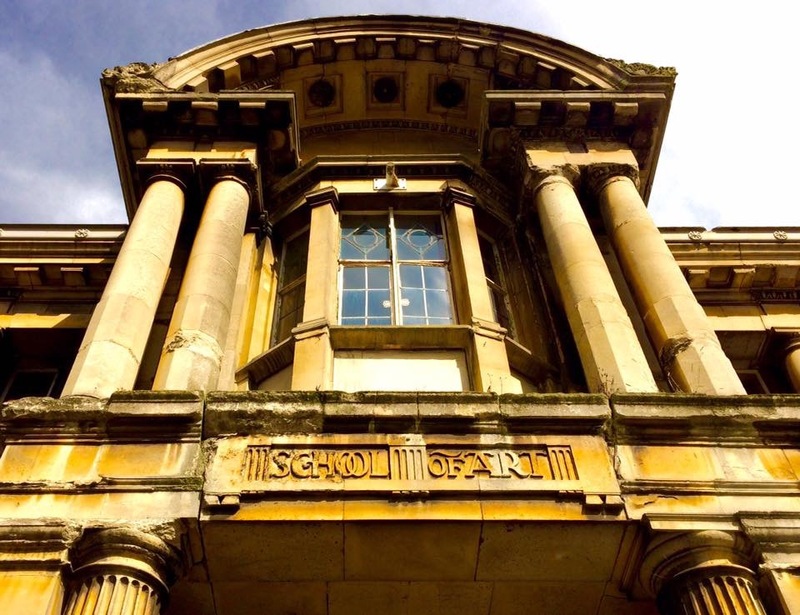 What attracted you to Moseley School of Arts as a building? Designed around light and space as currency. When was the Real Junk Food Project born? TRJFP was founded in Leeds, in December 2013. TRJFP Brum was founded in October 2014. What does the Real Junk Food Project aim to do? We aim to abolish all avoidable food waste. Along the way we’d like to REALLY Feed the World! How do you go about achieving those aims? Everyday in Birmingham over 650 tonnes of food is thrown away, most of this is perfectly edible. We take a small faction of this food and feed it to people, on a Pay-As-You-Feel basis. Since our inception TRJFP Brum has intercepted over over 30 tonnes of food and fed over 8,000 people! What is the idea behind the “Pay As You Feel” scheme? PAYF is a revolutionary concept – we don’t pay for the food waste we intercept (although we do have overheads) so we don’t charge people to eat it. It is criminal that, in the 21st century, in the UK there are people who cannot afford to eat a healthy, balanced diet. We feed everyone, regardless of whether they have money in their pocket. However, we do not give the food away for free – we ask everyone who eats with us to contribute in whatever way they can: tell a story, sing a song, help with the washing up or (more recently) help us grow the food we will serve in one of our grow sites. How does the Real Junk Food Project tie in with Brum Spirit’s message? 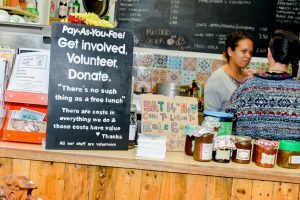 TRJFP Brum is aiming to rebuild our communities around food – we welcome all to our cafes and hope that we can engage the audience to participate with our project for their own and their communities health and wellbeing. Has the Real Junk Food Project Birmingham ever collaborated with other similar projects in the city? Where does the inspiration for the meals you create from intercepted waste come from? From our volunteers – we run an open kitchen where everyone is encouraged to voice their ideas and opinions. Oh, and sometimes Google! Where can we find the Real Junk Food Project regularly in Birmingham? We’re at Ladywood Health and Community Centre, St Vincent Street West (B16 8RP) every Wednesday (12-2 & 6-8pm) and Friday (12-2 & 3:30-5pm). We’re also at The Haven Centre, 54 Rilstone Road (B32 2NR) every Monday 12-4pm. We have regular (monthly) pop-up’s at ORT Cafe, Balsall Heath, on the 3rd Saturday of the month and Digbeth Community Garden (as part of Digbeth First Friday) We also pop-up all over the place so check out our website or Facebook for more details. 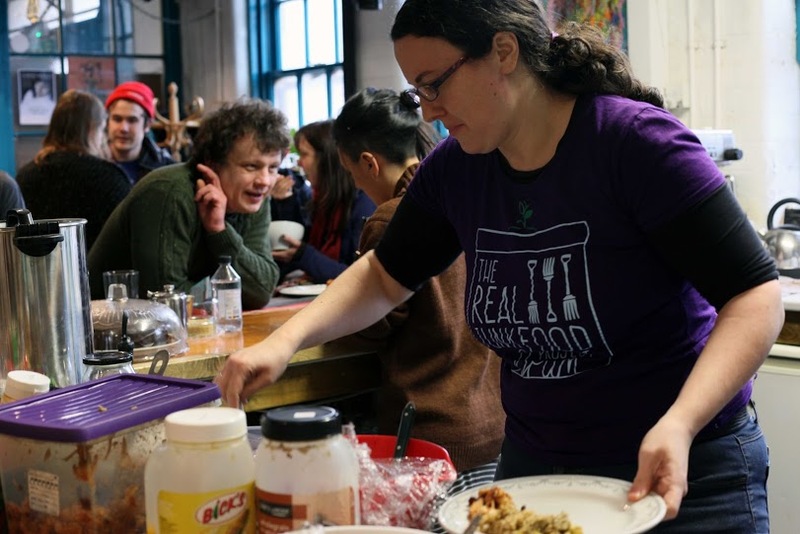 How can people get more involved and volunteer with the Real Junk Food Project? Come dine with us! Fill in our volunteer registration form here. There’s not long to go now ‘til Brum Spirit 2016: We’re In This Together gets going, and we’re so excited! 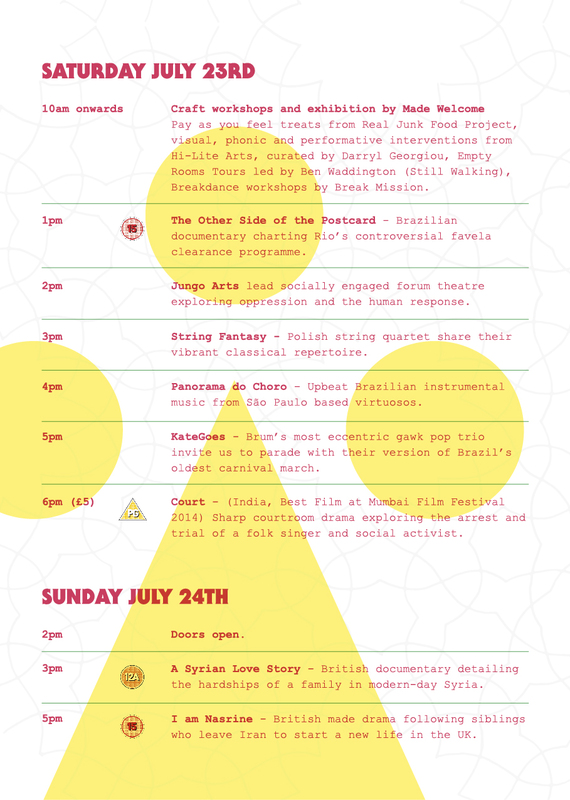 Over the weekend of 23rd-24th July, we’ve got a whole lot of film, music, arts, and feasting lined up for you all to enjoy. Our programme of family friendly, free and affordable events will bring us all together to explore the thrills and challenges of sharing spaces in this ever-changing world of ours! Like we said, most of these events are totally free, and the rest very affordable, but please RSVP to let us know you’re coming here. It all kicks off from 10am on Saturday, and 2pm on Sunday, but you can check out exactly what’s happening when below. In the meantime, remember to check in with us online to keep up-to-date with all of the latest news on Facebook here. The countdown is on! We hope you can join us for another Brum Spirit celebration! Have you been passed the River Rea recently in Basall Heath? If so you will have seen our latest public art mural, We’re In This Together! The mural called on the expertise of the team behind the well known ‘Welcome To Kings Heath’ mural, created back in 2013 by local talent Hoakser, who at the time teamed up with visiting Brazilian artist Ficore. This year our commission has transformed an over-looked wall on the banks of the river Rea when Hoakser team up with Lebanese duo AshekMan. Hoakser’s work ranges from public artworks to private commissions, which are currently held in collections in 13 countries across five continents. Most recently he was called on by Ebay to feature in a short film about his work. 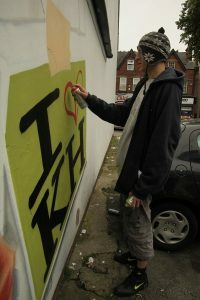 Birmingham graffiti legend Zooki grew up in Balsall Heath, the site of this year’s Brum Spirit mural. He has been painting for well over 20 years, and his style is very distinctive. 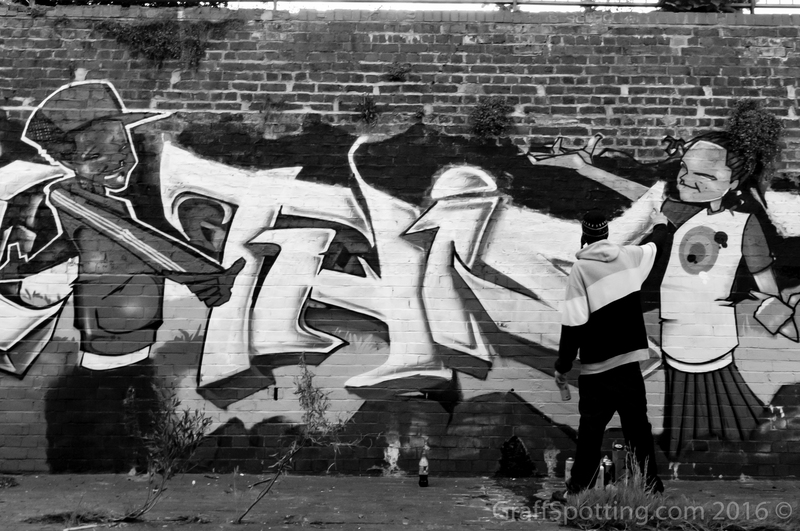 For those who know their graff culture, Zooki is in FKS, NHS and INS crews to name a few. His sharp style contrasts smooth graphic lines with old school references to graffiti’s roots, with characters straight out of a Bronx block party transposed into brightly contrasting everyday settings. Collectors can currently get a hold of his prints, T shirts and canvases at Graffiti Artist, in the heart of Digbeth’s Custard Factory. 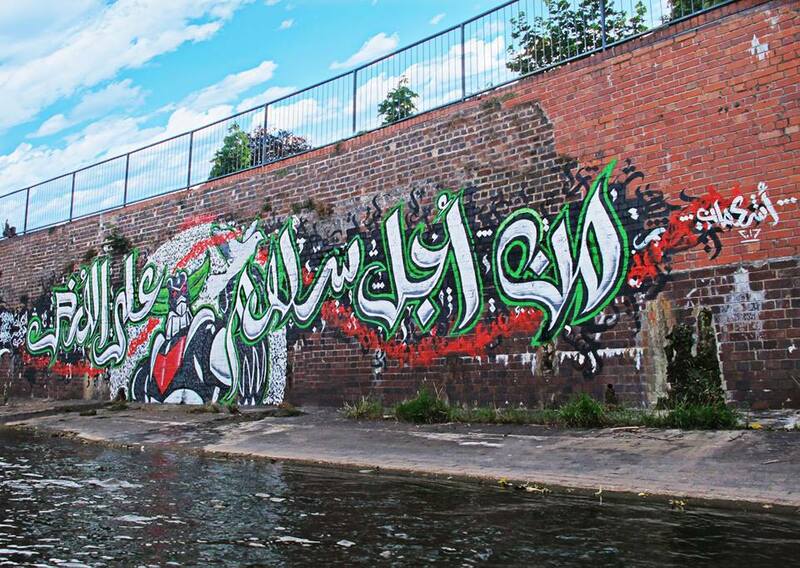 Ashekman traveled to Birmingham from Lebanon for a flying visit to bring their well know Arabic Calligraffiti style of work to the mural. AshekMan are identical twins and are most known for commissions for the likes of Nike, Coca Cola, MTV, and even celebrities such as Snoop Dogg have purchased pieces! Ashekman have their featured character the Grendizer at the centre of the mural with the words ‘Peace on Earth’ in arabic, which is the 2nd most spoken language of the area. The theme of the mural is to honour people across the world who have made Balsall Heath their home, and to celebrate what the local community have achieved together. Have you ever worked in Birmingham before? No but we’ve visited lots of places in the UK before. We’ve been to London, Liverpool, Manchester – all over really apart from Birmingham! What’s it like being in Birmingham? What do you think of the city so far? People are very welcoming here, the people are very cool. We come from a city between Beirut and Dubai, and it’s a concrete jungle, but Birmingham is the opposite. It’s actually very relaxed and quiet here. We love how Birmingham culture is one big melting pot, there’s so many different religion and races all living in harmony, and that’s what it’s like in Beirut. What’s it like working with Birmingham artists? Very cool! 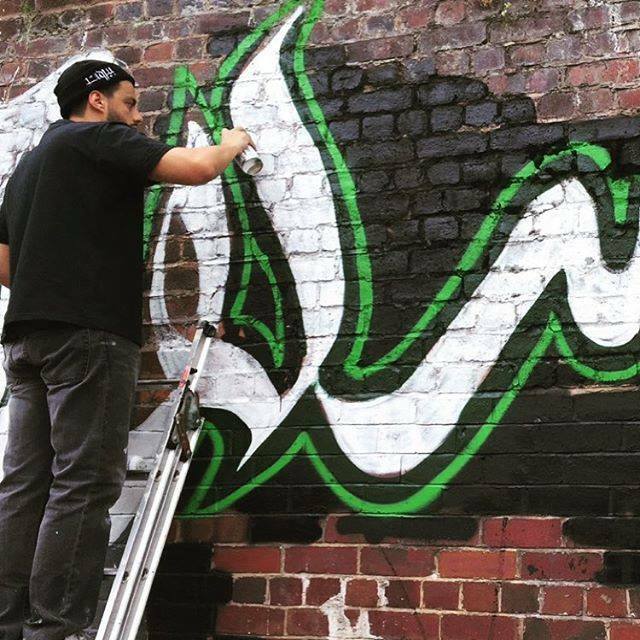 Our styles are quite different – our style of art is caligrafitti, is inspired by Arabic, which we’ve been doing for 10-15 years, but Hoakser and Zooki’s art is more like old school, traditional, pure graffiti, so our work is completely different to theirs and it’s a nice contrast. What’s the inspiration behind the mural? The mural is inspired by the city and the people who live in it. Where we come from, we write messages on the walls – that’s our main mission to spread a positive message – so Hoakser wrote in latin “we’re in this together” and we wrote in Arabic “For peace on earth.” At home, we use the image of Grendizer, the Japanese manga superhero, who has become a “good guy icon.” It’s important to mention that lots of people might think it’s vandalism, but it’s not, it’s about spreading peace and positivity.